Ask any Georgian what they like most about fall, and they’re likely to simultaneously shout about cooler days ahead. But family fall activities like corn mazes are a close second. Georgia is chock full of farms and fairgrounds offering fun, challenging corn mazes the whole family can enjoy. Get lost for a day (or maybe just a couple hours) at these 10 best corn mazes in Georgia. With nearly two miles of trail, you might actually get lost in this five-acre corn maze. Just $12 grants you entrance into the maze, where guests may spend upwards of an hour to make it all the way through. Once you conquer the course in the daytime, bring your flashlight with you for a nighttime experience that makes it even more challenging. If you really want to get lost in a corn maze, the one at Washington Farms is it. Sprawling across 8.5 acres, this giant maze is among the largest in the state. Pay attention to the clues and puzzles throughout the maze to help you find your way out—you might not make it without them. There’s something for everyone at Poppell Farms, but guests get particularly excited about a trip through the corn maze. Each year features a different design, so there’s always fun challenges to conquer. This charming locale is everything a farm should be—peaceful, family-friendly, and bursting with life. Set on 330 acres, guests can enjoy a hayride, games, cow train, corn cannon and more. They’ve also got one of the most impressive corn mazes in the state. If you happen to show up at sundown, make sure you bring your flashlight to help you find your way out! You’re sure to have an unforgettable adventure at Steed’s Dairy Farm. The corn maze here is a screaming good time, and one that’s perfect for guests of all ages. Chock full of secret twists and turns, you might need to leave a trail of breadcrumbs, you know, just in case. Known for its pumpkin patch and Christmas trees, Sleepy Hollow Farm also features a stunning corn maze to entertain the entire family. Once you make your way out, head over to pick out the perfect pumpkin, or enjoy a tractor ride, farm games, or their highly-rated Escape Woods adventure game. The most visited corn maze in Northeast Georgia, visitors will love getting lost in a new corn maze design each year. As impressive from above as it is from the ground, this corn maze features plenty of unique twists and challenges to make your experience unforgettable. For just $14 per person, you can get unlimited entry to the corn maze, pumpkin patch, petting zoo, pumpkin train, games, and more. Experience the cosmic corn maze by day or by moonlight, the choice is yours. If you’re brave enough to take on the maze by night, you’ll receive a flashlight and glow bracelet with admission to help you find your way. 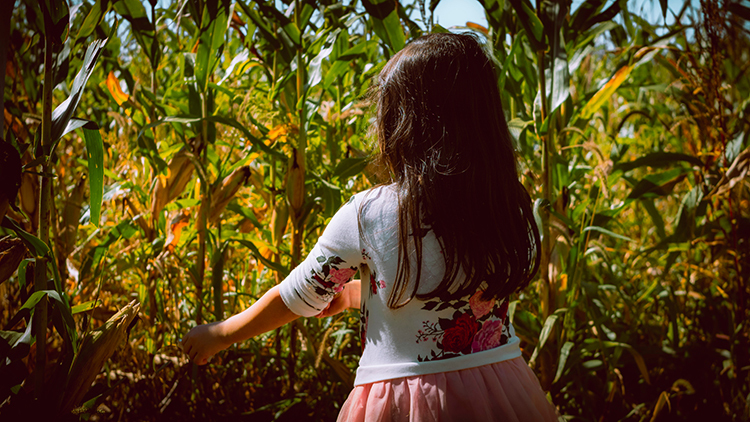 When you’re finished, make your way to one of several other fun farm activities, including gem and fossil mining, hay maze, haunted hayride, and games. This corn maze is nothing short of impressive. You’ll make your way through this labyrinth with no idea how far you’ve come or how much you further you need to go. Each year features a brand new design so there’s always a reason to keep coming back. Ready for some “cornfusion”? This uniquely challenging corn maze provides plenty of it. Most guests can make their way out in about an hour or less—will you be one of them? If you aren’t so sure of your navigational skills, there are three corn mazes here, all of varying sizes, so you can pick the one that suits you best. View more Georgia Corn Mazes.